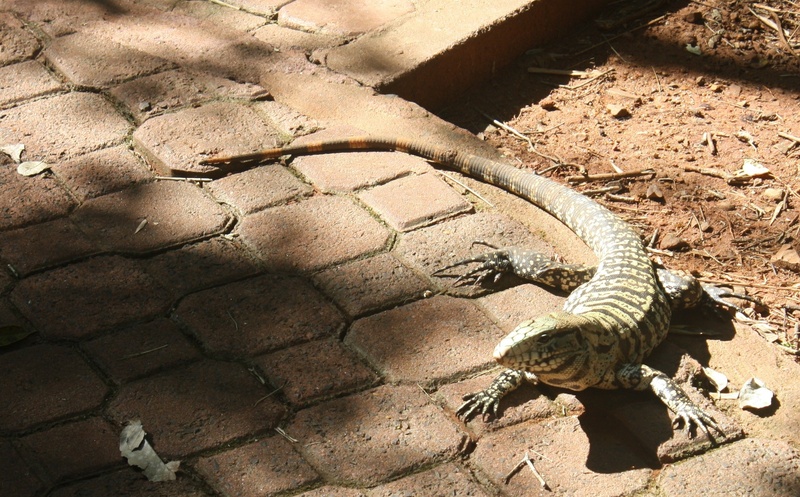 An aloof lizard patiently waited for me to pass along the Green Trail before scurrying on its way. As seductive as this triple frontier was, it wasn’t the main reason I had come to the town of Puerto Iguazu. Something much bigger was waiting for me the following day. So, bright and early, my taxi driver, Marcelo, took me to the Argentinean entrance of Iguazú National Park, and we arranged for him to return for me seven hours later. With a cheerful adios!, he was off, and I eagerly passed through the park’s gates and into a total fantasyland. 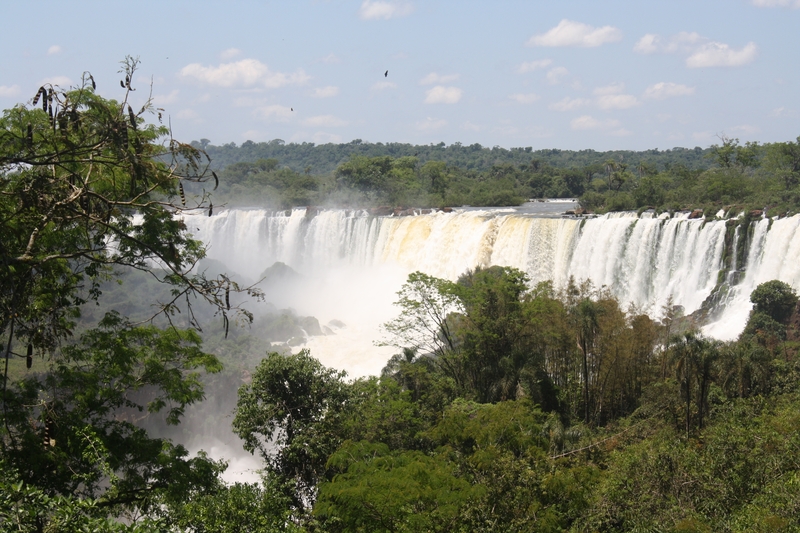 Established in 1934 and declared a UNESCO World Natural Heritage Site in 1984, Iguazú National Park was named one of the new seven natural wonders of the world in 2011. This is an extremely popular and very accessible park, so I knew I wouldn’t have it all to myself, even though it covers 212 square miles. In fact, some of the viewing platforms would be jam-packed with gawkers just like me. However, the Green Trail, which I picked up at the entrance and which does not access the waterfalls that everyone was here to see, was fairly empty, and often my only hiking companions were lizards, brilliantly colored birds, and raccoon-like coatis. The Green Trail links up with the Circuito Superior, a trail that gave me my initial glimpses of Iguazú. Before I left home, I had done thorough research on the park and had committed the numbers to memory: About 275 separate cascades compose Iguazú Falls; they’re about 100 feet higher than Niagara Falls; and, running for about 1.75 miles, they’re wider than Victoria Falls. But absolutely none of that truly prepared me for the utterly jaw-dropping sight before me, as the first set of waterfalls appeared between the trees to my left. Awesome, in the truest sense of that word, was the only fitting adjective I could have come up with for the grandeur of this place, and I had to take a moment to stop and convince myself that this was not some crafty Hollywood CGI display. As I walked along the catwalks over the Upper Iguazú River that, by and large, are positioned just before the raging waters plummet down to the Lower Iguazú River, I tried to imagine the reactions of the first Europeans who saw the falls — the Spanish and Portuguese conquistadors in the 1540s and the Jesuits who followed shortly after. Even if they had received well-worded descriptions or meticulously crafted drawings from anyone who may have preceded them, I’m sure they would have been as awestruck as I was, half a millennium later, so I concluded that our reactions must have been quite similar. 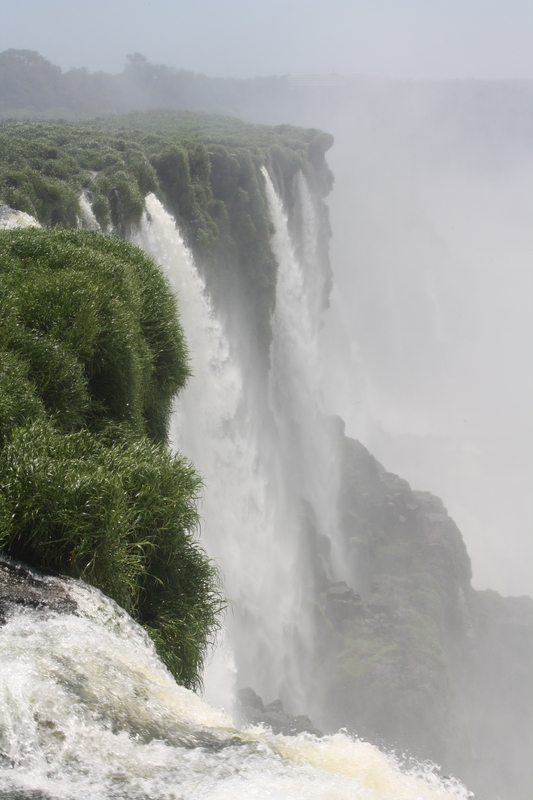 At 269 feet high, Devil’s Throat is the park’s main attraction. Of course, I benefited from the development of the park that makes it an easy destination, whereas the Europeans had to battle the elements as well as the Tupi-Guaranies, the Indians who had coined the name Iguazú (“Big Water”) and who had, themselves, forced out the area’s first inhabitants, the Caingangues Indians. Dropping my thoughts of the past for the pleasure of the present, I continued along the trail, passing over the edges of such individual cascades as dos Hermanas, Bossetti, Bernabé Mendez and Mbiguá. At the end, I was rewarded with stunning views of the San Martin falls as well as the island of the same name. The highlight, however, was still to come. I boarded the British-built roofed Rainforest Ecological Train with open sides that runs through this section of the park and stops at three stations. I disembarked a couple of miles later at the Estación Garganta del Diablo (Devil’s Throat Station). Metal catwalks then led me over the rapid Upper Iguazú River — extremely wide and seemingly endless. Along the way, my anticipation built as I crossed island after island — large ones covered in greenery, and small ones that had only enough room to accommodate one lazy turtle. But, as I passed the half-mile mark, my final destination seemed evasive. Viewing platforms take you right to the edge. 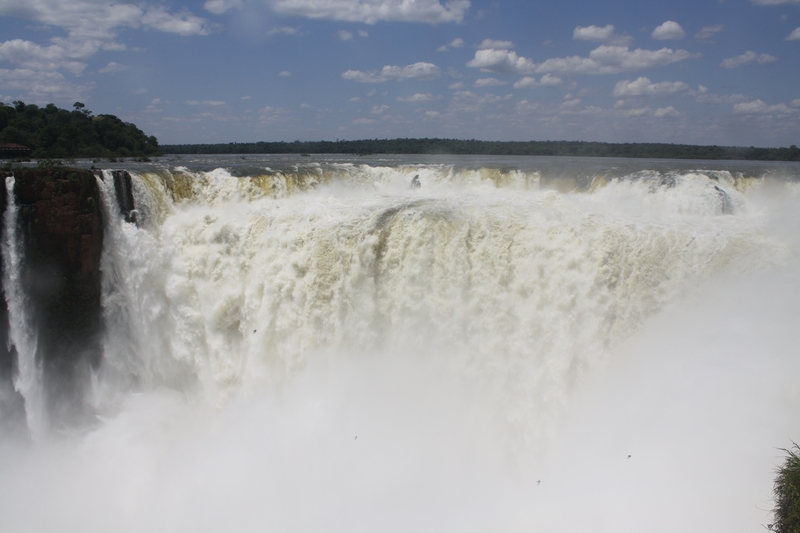 Eventually, the Garganta del Diabo, the most massive waterfall of them all, began its welcome assault on my senses. First, my ears picked up the rush of the water as more than 4,100 gallons per second plunged the 269 feet to the river below. As I got closer and closer, the spray rising from this perilous drop began to cool my skin. The rush grew steadily into a tremendous roar. At last, the visual payoff: the most stunning U-shaped waterfall imaginable in the midst of nothing but blue sky and green trees. On one of the platforms, I was totally seduced by the series of falls to my left, and by the falls across the river on the Brazilian side of the park. I peered down into the thick spray, shrouding the river below, making it impossible to see. Pop-up rainbows arrived suddenly and dissipated just as quickly. Birds dove into the spray, disappeared from sight, and came soaring out of it from somewhere else. Butterflies landed on the railings. I knew that this was the closest I would come to paradise during my two weeks in Argentina, and I savored every second of it. After I soaked in the most magnificent waterfall I had ever seen — and took a little soaking from the spray, too — I headed back to the train. A flight of yellow butterflies flittered alongside as it passed through the jungle and returned to the station, where I picked up the Circuito Inferior. This trail led me down almost to river level, where I was treated to a completely different perspective of the falls. You can catch a boat to San Martin Island here, or one to the closest you can get to the base of the falls. I opted to continue my hike to its end, where the final platform gave me the opportunity to look directly up one of the cascades. If the spray at Devil’s Throat got me a little dewy, the spray down here thoroughly drenched me. In fact, moisture around the falls is so constant and so abundant that it could help a pine tree grow to maturity in 20 years, as opposed to about 70 in more temperate climes. 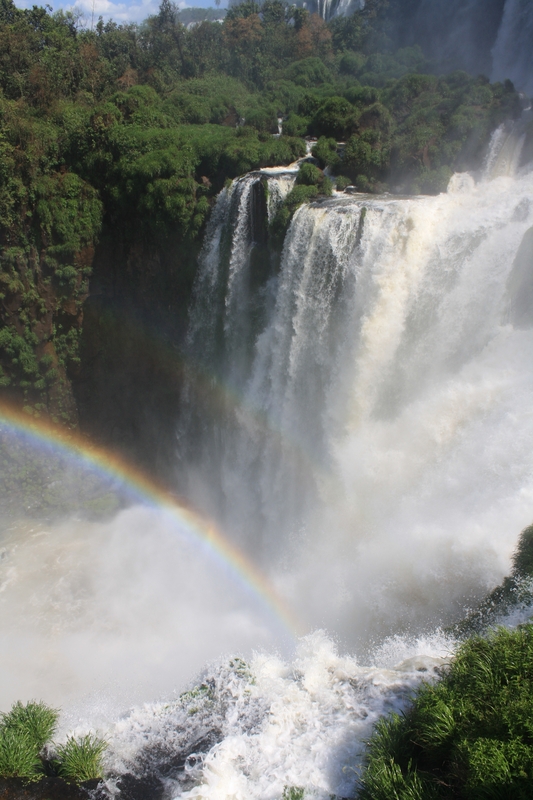 Rainbows add to the astounding beauty of the falls. I had thoroughly dried out by the time I walked back to the entrance to the park. I browsed the well-made and attractively inexpensive goods being sold by the Tupi-Guaranies at their outdoor market stall, waiting for my taxi to return. When it arrived a few minutes later, I gave a parting look at the park and slid into the front passenger seat. “Did you enjoy the cataratas?” Marcelo asked as we headed to my hotel. I sighed with contentment and a touch of regret. “Seven hours was not enough,” I replied. Iguazu is my favorite place in the world! You describe it completely and very well. Thanks for taking me back for another visit!